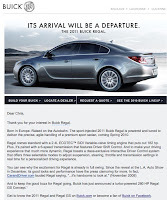 The Auto Marketing Blog: Is the Buick Regal a Departure or a Band-Aid? Today I received the first email communication for Buick Regal handraisers. The vehicle just debuted two weeks ago at the Detroit Auto Show. Or is it still the North American International Auto Show? Either way, the Regal is the latest injection of sporty European car design coming to America via the Opel brand. The Regal is an Opel Insignia re-badged and reconfigured to meet U.S. taste. It is definitely an interesting car and won the highly prestigious European Car of the Year award back in 2008. What’s most compelling to Buick fans and others interested in GM products is how the Insignia, sorry Regal, is a sport worthy sedan. To some extent, it fills the enthusiast hole left when GM pulled the Pontiac brand and its G8 from the product portfolio. 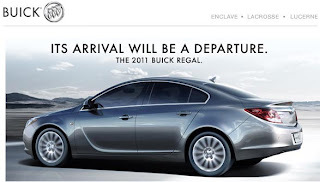 The Regal’s “Its Arrival Will Be A Departure” message communicates the redefining of the brand that has been underway since the Buick Enclave and, more recently, Buick LaCrosse. Regal is a more complete departure from the brand’s image of big cars with soft suspensions appealing to elderly American drivers. This new entry brings a more sport tuned suspension, European handling and Brembo brakes, at least on the car shown at the Detroit Auto Show. In a way Buick is becoming what Saturn always wanted to be, a stylish European answer within the General Motors lineup. Is the Regal the first of many Opels on its way to the States? European products tend to have more upscale appeal to American taste and upscale premium is where GM wants to go with the Buick brand. Is this a departure Buick will continue to take? Or is this just a quick one product injection to show consumers there is a "New GM" in 2010? UPDATE: Seems I might be on to something here. Just a little after I posted this blog, GM Inside News (@REALGMI) just reported that the coming Buick compact car is a slightly reworked Opel Astra sedan. I love it. You hit the nail on the head with your description of the Buick historically being "soft suspensions appealing to elderly American drivers" - though, admittedly, even in my youth, the LeSabre has always had some strange eye-appeal for me. The Regal has always left a lot to be desired in the "looks" department and I absolutely love the way this car looks. Here's hoping the performance and ride quality match-up well with it. Give us the Regal GS and I'll be convinced that they're really making an effort to go this "departure" direction. One car that's mildly sporty won't change the direction of this brand. There needs to be big change. The GS has that potential.